Travel brochure "Über die Donau nach dem Seebad Varna und nach Istanbul," 1936. Signed "Kosel." 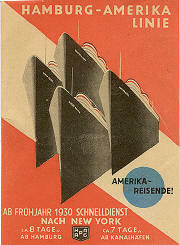 Label "Hamburg-Amerika Linie - Amerika Reisende!," 1930. After a poster by Henning Koeke. 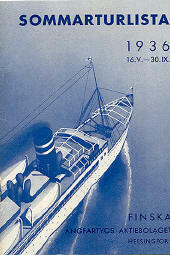 Travel brochure "Götha Bolaget - Göteborg-Antwerpen," 1938. 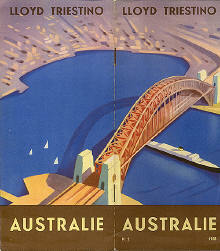 Travel brochure "Lloyd Triestino - Australie," 1938. Designed by "Pizzi e Pisio - Milano-Roma." Travel brochure "Sommarturlista - 1936 16.V. - 30.IX." 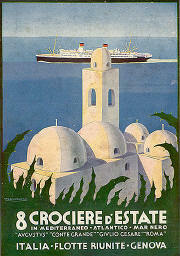 Advertisement "8 Crociere d'Estate in Mediterraneo - Atlantico - Mar Nero," circa 1936. Signed "P.V. Accornero." "Travel brochure "Exposition Internationale de Chicago 1933 - Voayages Spéciaux aux Etats Unis." 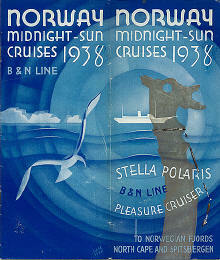 Travel brochure "Norway Midnight-Sun Cruises 1938." Signed "Glaesser."